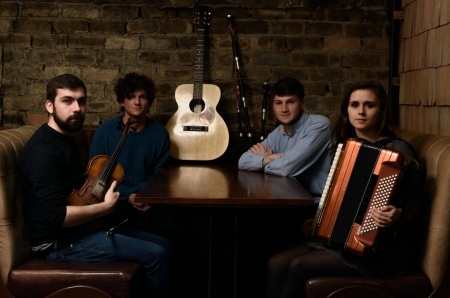 Eabhal are four musicians who met and began making music together on the Outer-Hebrides’ Isle of Uist, taking their name from the iconic North Island hill. Playing folk and traditional music from Scotland, Ireland, Asturias and further afield alongside self-penned tunes and Gaelic songs, they produce a melting pot of sound representative of their different backgrounds. They are the 2018 winners of the “Battle of the Folk Bands” and runners up for “Up and Coming” at the Scots Trad Music Awards 2018.